Police Car Video Kiddie Ride is a funny children's kiddie ride which combined with the police catch thief mini game. 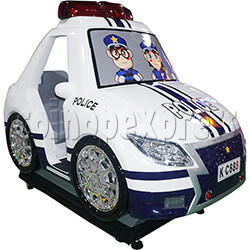 Shape design of the cartoon police car, it is very cute and funny. Feature with the 19" high-definition LCD screen and steering wheel for player interact with the mini game. During the game, player controls the police car to advance and catches the thief in the video game by the steering wheel, buttons and the accelerator, while enjoy the kiddie ride game. Player sit on the seat, insert the coins, and press any button to start the game. Machine starts swinging, player control the police car to advance by the steering wheel. Control the police car close to the thief, press the handcuffs button to throw the handcuffs, if the handcuffs touch the thief can catch the thief. During the game, stepping on the accelerator can accelerate the car, press the speaker button the car makes a sound like honking, press the alarm lamp button to turn on the alarm lamp, press the handcuff button, the screen will have the action of throwing handcuffs, rich game content, bring players more fun.